Sony MDR-7506 Studio Headphone designed for professional studio and live/broadcast applications. The Sony MDR-7506 is a large diaphragm foldable headphone designed for professional studio and live/broadcast applications. The quality is proven given the facts that it exists in the market for nearly 2 decades. MDR-7506 is the natural choice for most the soundman/ recording enginer for best audio monitoring. When you are talking of sleek, sensitive, and isolating studio headphones, the list is never complete without Sony MDR-7506. This unique headphone boasts of a wide range of admirable features making it ideal for both traveling and professional field recordings. At first glance, one would be tempted to think of the iconic Sony MDR-7506. Except for the professional sound quality, its other major features are closely similar to the legendary Sony MDR-V6. Thirty years down the line and still counting, this headphone has remained people’s favorite. At this point, one might necessarily be tempted to ask the million-dollar question: why is the headphone still preferable and why has it remained popular for that long? At first sight, one would admit that Sony MDR-7506 is tempting you just feel like buying one for yourself. Its unique design makes it easily portable. A simple fold is all you need to wrap it up and keep it its soft case, ready for traveling. Even more, it features a closed-ear design making for extra comfort. Getting such an awesome headphone for slightly more than USD 100 is something so many people don’t want to miss. Well, that explains why Sony sells over 10,000 pieces monthly. It doesn’t take anything to admit that they rank among the best headphone choice within their price range. For someone looking for closed-back headphones, Sony MDR-7506 would be a perfect choice. With this design, the user can have the headphone perfectly fitted to his head without unnecessary pressure. You don’t have to worry about it getting sweaty after sometimes because that never happens. 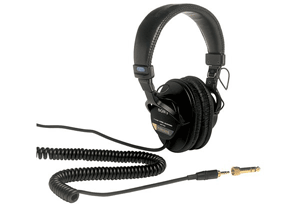 If you have used these headphones, you will admit that they work perfectly well when it comes to sound isolation. Whether you are using them on iPods, portable video recorders, or other devices, you will always be guaranteed of quality sound. It rarely leaks sound making it comfortable for use in places where there are many people. With the great deep bass, one can detect the slightest rumble. Right from the look, everything about Sony MDR-7506 speaks the insoluble truth; it is designed for professionals. It serves as the best technical device for career producers to hear what’s not okay with a recording when they are still capable of rectifying it. As much professional says, Sony MDR-7506 helps you hear what’s off and not what good with a recording or music. You might not compare them with the high-end Beyer T70p, but they are perfect enough considering their prices. One undisputable feature of Sony MDR-7506 is its sensitivity. Regardless of the external device, it is connected to you wouldn’t need any extra amplification. When following your favorite series episode on iPad, you just need to keep the volume below 5/8 and still feel okay. It is even more sensitive with iPods. Some might as well admit that this headphone is loud and clear on almost any device. That partly explains its continued popularity over the years. With a rated sensitivity of 106 Db and ImW, it is far better compared to most headphones in the market. For those who have had an experience with this headphone, the fact that it features an excellent bass response is almost is almost undeniable. The emanating sound is strong and solid without the booming effect that is common with most headphones. Closer consideration reveals that there is minimal bass variation with regards to pressure. Pressing them closer to your head doesn’t necessarily alter the bass making it such a perfect choice for someone who needs comfort and quality. Amazingly, there are no bass leakages with this headphone. Even some more expensive headphones cannot match this quality. Boasting of Ultrasone Edition 8 design, the natural bass Sony MDR-7506 produces is ideal for watching movies on your laptop besides studio recording. At the end of the day, every customer needs an appealing answer to the nagging question is it durable enough? However perfect a device might be, it isn’t worth it if it cannot stick around long enough for you to enjoy its benefits. The metal plug and adapters of Sony MDR-7506 ensure maximum endurance. It is strong enough to sustain multiple abuses from Television station visitors who might not appreciate their prices. That explains its popularity in TV scenes, since the 1980s and still counting. Have you ever been keen on its hinges and height adjusters? Well, they appear to be stainless steel. What more could be better than that regarding durability? For someone who needs, a warm, comfortable, isolate, and affordable headphone, Sony MDR-7506 would be a good recommendation. Even more for sound engineers and professional music producers, it is quite a choice! They will not disappoint you rest assured of that. Gold, Stereo UniMatch plug 1/4" and 1/8"
As at today 31/March/2017, please note Sony MDR-7506 is made in Thailand, this has been confirmed by Sony. We have no comment for those sets which claimed to be make in China or anywhere else, with very attractive offer. This has been my 3rd set I purchased from the same shop, I got my first set in 2015, unfortunately I lost it after our production, I am the loyal user of this headset as I could not find the equivalent at this price point. Someone persuaded me to try others make but I took no risk in my decision. I damaged my second headset owing to my carelessness .Thus I wish the next time I buy my fourth set is not near the immediate future as I will take the extreme care for my 3rd set. Else I will need to spend money again. In any case thanks for the great service. I have been hunting for this Sony MDR-7506 in Singapore. I have gone to many department stores including Sim Lim but to no avail. Most of this items are sold in Amazon, or B&H USA store. Through recommendation of my Friend I found this wonderful Sony authorized store which retails most of the Sony professional Video and Audio gear. I will come back again to shop for my future professional gear in your shop. However those of the lowest prices are shipped from overseas and the source is unknown. Added to them we might need to pay extra for the GST. To have peace of mind I rather come to your shop where you allowed me to inspect the goods before payment. I am happy with the warranty too. As far as I could recall, Sony MDR-7506 was first seen and used by us back in 2003. 13 years later the same headphone is still available in the market. A headphone which lasts so long must have its story behind. The common complain of this product is the sound responce is Flat. But this is exactly what we wanted in managing the audio mixing quality, it allows us to get exactly and accurate and better sound reproduction, with this "Flat" feature I can easily use the equalizers to customize the sound. Hi Could you please share with us how can I this Sony MDR-7506 professional headset in Manila, do you have shop here ?